Treat yourself to a rewarding stay at Radisson Jalandhar, the city’s only international Five Star Hotel and a premier destination for visit. An unbeatable choice for comfort and sophistication, the Radisson boasts world-class services like on-site dining, a fitness centre, complimentary Wi-Fi and a business centre. Like any hotel, Radisson Jalandhar also focuses towards offering the best service to the guests for comfort and relaxing stay. The existing complimentary WiFi in the hotel not able to satisfy guests Internet experience just due to this, they need to upgrade their setup. Here we narrate the problems, consequences, diagnosis and solution, which proved to be a remarkable change and helped in achieving desired results. Even High speed 20MBPS ILL was not able to get customers happy. Internet plans can’t be made to differentiate the nature of usage or as per the room category. Distribution of the bandwidth was not there so when somebody using high speed Internet like playing online games & videos or any torrent download, rest of the guests has to suffer for slow Internet. Due to Huge Volume of users unmanaged Bandwidth is one the major pain area for the hotel. Hotel was not able to detect usage & control user bandwidth limits. 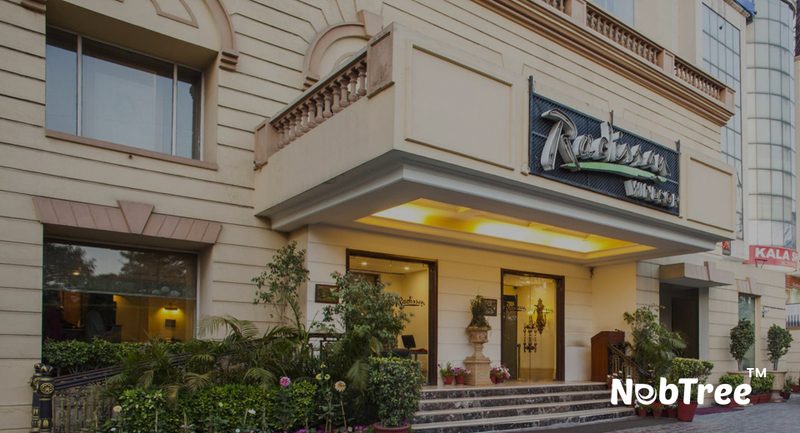 As Raddison Hotel is one the prestigious five star rated property, High profile guests has to suffer for low Internet Speed and hence this is resulting in a poor customer feedbacks and also affect online bookings & loss of reputation. To resolve any problem one must dig out the root cause. Wifi connectivity was excellent accross all areas. Internet connectivity was adequate in comparison of rooms. Unmonitored high data usage by users used to bring down the level of services. After spending lots of money on the Internet service they are not getting high Quality of Services. NebTree was placed between Internet lines and WiFi setup. Internet plans for guests were created for controlling speed and usage. 200MB daily limit with speed of 1Mbps per device for 2 users in standard room. 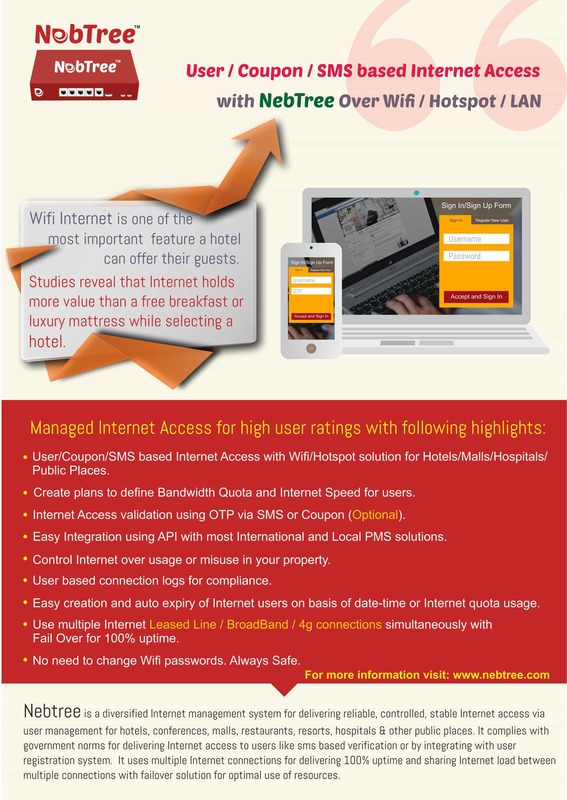 400MB daily limit with speed of 2Mbps per device for 4 users in Deluxe room. 500MB daily limit with speed of 4Mbps per device for 4 users in Elite room. Logs were maintained for compliance purpose. Helping in tracking activities & make you ready when government officials knocks your door. Stopped unrestricted and unaccounted use of the Internet. Users were created with pre defined expiry date and time to ensure that Internet stops working after defined date and time for device. Bandwidth Consumption was managed and high speed Internet is always available for everyone staying in the hotel. When guests experience a seamless WiFi connectivity throughout their stay, it reflects positively on your property and your brand. Automatically due to planned Internet usage, bandwidth consumption got controlled & resulting in good Internet speed to guests. Better rating on websites like TripAdvisor, MakeMyTrip, GoIBIBO etc resulted in better business and reputation. Nebtree WiFi solution successfully met all of Radisson Hotel objectives and resulted in increased customer satisfaction with enabling to deliver luxurious WiFi experience to their guests. Quickly, easily, and affordably.